This is Mark Kaplan, Debbie’s husband and today’s guest blogger. You may know me from this website for the snarky comments which have been attributed to me. But today I get to go beyond the snark, and write about my trip to the California State Railroad Museum in Sacramento with Zack and my stepfather. 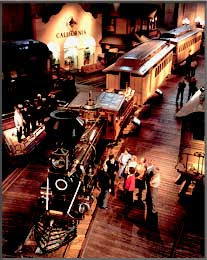 Much of the museum is dedicated to telling the story of the transcontinental railroad: initial funding (learn how Leland Stanford made his money), laying first tracks, and the challenges of building over the Sierra. The Western terminus was in fact two blocks from where the museum sits. Every hour there is a fine 20 minute film on the subject, and a half-hour lecture right after. The museum also has scads of historical engines, railroad cars, and railroad memorabilia from both the 19th + 20th centuries. While most of the cars you could only look at from the outside (needless to say they did not capture my son’s attention) some you can actual go inside of (e.g. a dining car from turn-of-the-century, mail car from 50 years ago, sleeper car from the 20s). I enjoyed seeing the china and silver place settings, from an era of far more gracious travel than we have today (well, if you could afford it), although my 26-year old self who was bored to tears registering for china at Macy’s would shake his head in shame at the middle-age suburbanite I’ve turned into. There’s more on the second floor: antique toy trains, a giant model railroad with 4 trains going, and – best part – a giant Thomas play area where the kids play and dads can read The Economist (grandpa read The NY Times on his Kindle). There's a nice gift shop (thanks Grandpa! Dad wouldn’t have been nearly so nice) and lunch spots within walking distance. In fact there are other attractions in the “Old Sacramento” area (Leland Stanford Mansion...the Capitol), but for my 5 year old son the Railroad Museum was plenty for one day. Getting there can be half the fun. You could take I-80, but it’s pretty blah (unless you stop in the Budweiser factory tour in Fairfield…look for that on my kaplanbachelorparty.net blog). What better way to get to a train museum than…the train! The Museum is two blocks from the Amtrak station; take the Capitol Corridor which runs several times a day in each direction. It goes along the Bay and through the Delta region for a very scenic and relaxing ride. Better yet, catch the California Zephyr in the morning in Emeryville and you can sit in the lounge car for a great view. Just don’t sleep through your stop or 40 hours later you’ll end up in Chicago! And a shout-out to my friend Lorne for telling me about the Museum in the first place.